This summer, turn off the TV, turn off the computer games, turn off your cell phones and get outside and get reacquainted with nature! The City of Albuquerque Open Space Division is participating in the national No Child Left Inside movement by partnering with the Nicodemus Wilderness Project during our Open Space Summer Series. 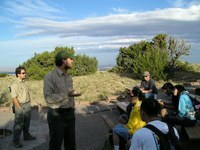 Young people who attend specially designated Summer Series and complete an Apprentice Ecologist Initiative project through the Nicodemus Wilderness Project will be rewarded with a complementary Open Space parking pass good for 6 months at the Elena Gallegos Picnic Area and Boca Negra Canyon in the Petroglyph National Monument. The Nicodemus Wilderness Project is a worldwide organization based here in Albuquerque, and the adopter of the Piedra Lisa Open Space in the Sandia Foothills. Their mission is "to protect wildlife and our environment and to build future conservation leaders by engaging youth in environmental stewardship projects worldwide". They accomplish this through their Apprentice Ecologist Initiative. To participate, youth undertake an environmental cleanup, conservation, or environmental education project. They then write an essay about their project results and what they learned during the project. The author of the best essay wins a $500 scholarship toward their college fund. This year, our vision is to use the Open Space Summer Series to draw families outside and in to Open Space and to encourage youth and their families to participate in the Apprentice Ecologist Initiative. The goal of the Apprentice Ecologist Initiative is to elevate young people (especially at-risk and low-income kids and teens) into leadership roles by engaging them in environmental stewardship projects, which empowers volunteers to rebuild the environment and social well-being of our communities, and improves local living conditions for both citizens and wildlife. *Please call Bill Pentler at 505-452-5222 with any questions about this initiative.